We are located 40 miles North of Reno, Nevada, 40 miles South of Susanville, California, East of Hwy. 395 and the town of Doyle, CA. Visitors are always welcome, but please call ahead as we are usually out on the ranch. 748-200 Lazy Heart Lane, Doyle, CA. Please use the form in the lower right corner of the page to send an inquiry or feed back about our product . . . We would love to hear from you. Go north on 395 from Reno to Hallelujah Junction, about 30 miles. In another 16 miles, you will enter a broad valley and see a large ranch on the left with pivot sprinklers, cattle, maybe llamas.....Now you are close. Next you will see a highway sign that says "Doyle Loop." Bear to the right and head toward Doyle for about 1/2 mile. Before you get to Doyle, you will see a street sign that says Hackstaff Rd. Turn right. In 1/2 mile you will encounter two bridges, one being a single lane. Turn left after crossing both; you don't have any other choice. Go 1/2 mile and you will see another street sign, "Lazy Heart Ln." Turn right, go 1/4 mile and you will see a single 4 x4 post with the numbers 748-200. Bear to your right, and our home is 1200' ahead with a green metal roof and log siding. Welcome to the Side by Side Ranch. This is where everything started from. 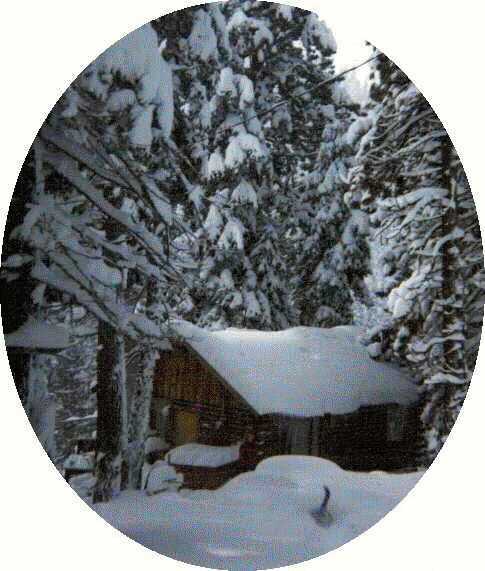 In 1983, 800 inches of snow fell on Donner Summit, and Janet Hunter called to say she was dropping by to visit an old commercial fisherman that lived in a 500 sq. foot cabin just outside of Tahoe City, CA. Copyright 2011 Side by Side Ranch. All rights reserved.